After our Bomod-ok Falls hike, we all again boarded to our hired jeepney and returned to Sagada town proper to pick up our packed lunch. 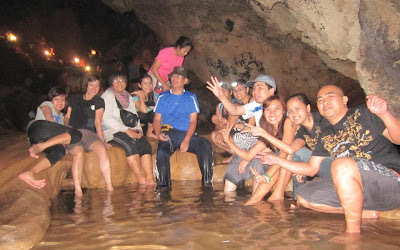 This was partaken off while on our way, down Suyo Rd., to Sumaging Cave (also called Big Cave, Marcos or Latipan Cave), another of Sagada’s popular and frequently visited attractions Sumaging Cave has the largest chamber of Sagada’s 60 known, connected caves. My companions were slated to go spelunking there and Jandy and I gamely joined in. We have entered this cave 15 years ago (Jandy was 12 years old then) with a lone Kankanai lady guide but we only went as far as the King’s Curtain. With his then small frame, Jandy simply could not make it down the “curtain.” For this spelunking tour, we still wore the same clothes we wore at the Bomod-ok Falls hike but I brought along my waterproof case for my camera. Jocie, our tour coordinator, chose to stay behind, having been in this cave twice before. Upon alighting our jeepney, we all went down a path leading to the cave’s big yawning entrance. 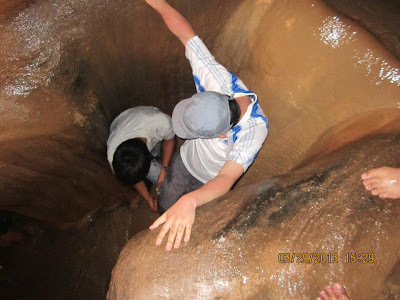 Entering this cave doesn’t require special training or equipment but were required to register at the Municipal Hall and bring along 2 local guides with Petromax lamps. 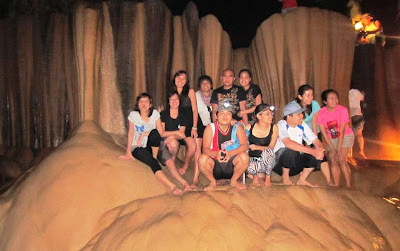 Just like in Bomod-ok Falls, the place was crawling with tourists with the same intention as ours. After a briefing from our guide, we all began our steep descent along the first 100 m. of the trail, the rocks made slippery by being coated with slimy guano (bat droppings). The “Dancing Hall” and “King’s Curtain” were quite impressive. To get down the latter, which we failed to do during our previous visit, we had to use the thighs of our guides as stepping stones and their hands and shoulders as supports. From there, we had to rappel (rope-assisted descent) down a slippery rock wall, to a cold, knee-deep underground river with crystal-clear waters. 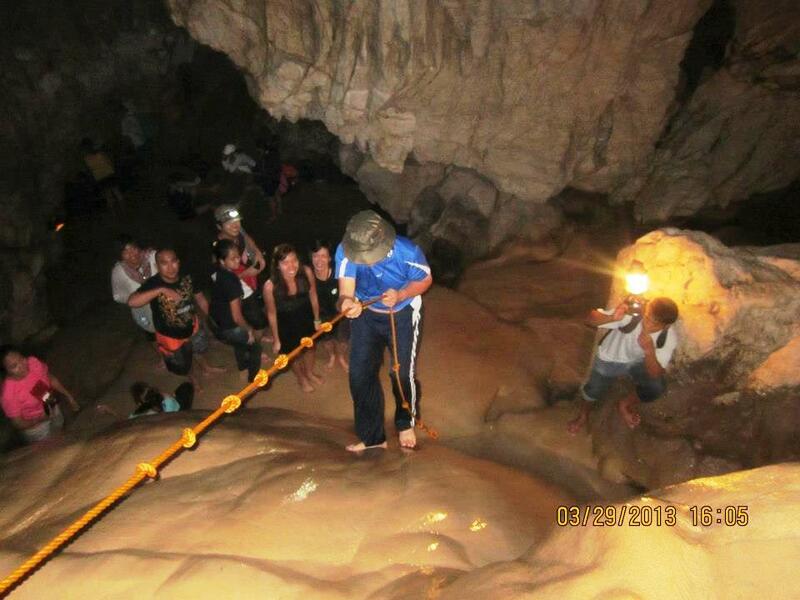 On our return trek, we again have to rappel up as well as climb up a rope and rubber ladder. 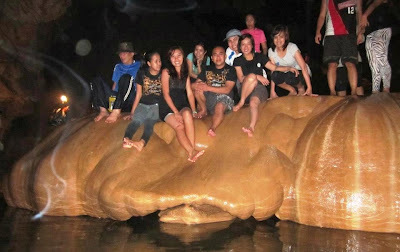 Our tourist route took all of 2 hrs. 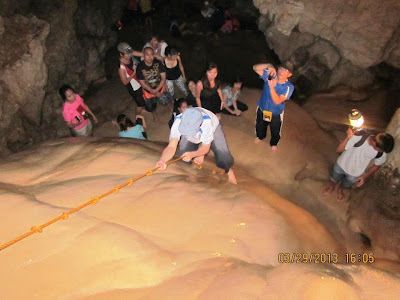 Other tourists were doing the more challenging and very difficult Cave Connection, a full exploration of Sumaging and Lumiang Caves which may take 3-4 hrs. We exited the cave all sweaty, smelly, muddied, very tired but safe. Jandy had some scratches on his elbow from a slip but was, altogether, unhurt. I came out without a scratch but with aching muscles from 4 hrs. of morning hiking and 2 hrs. of afternoon spelunking. Not bad. Not bad at all. This entry was posted in Mountain Province, Philippines, Republic of the, Spelunking by Benjie Layug. Bookmark the permalink.